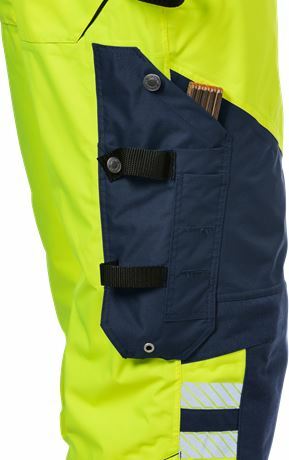 Functional high visibility shell trousers in water and windproof material with breathing capability. 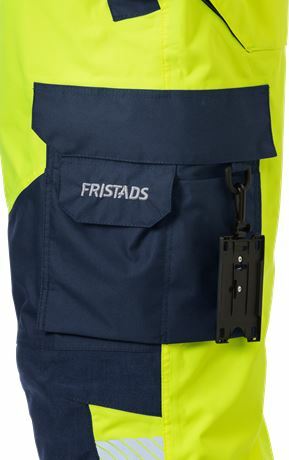 Pliable and durable trousers with detachable braces and soft fleece lining at back and in pockets. Material: Airtech®, 100% polyester, breathable, wind and waterproof. Lining: 100% polyester. Reinforcement 100% polyamide. 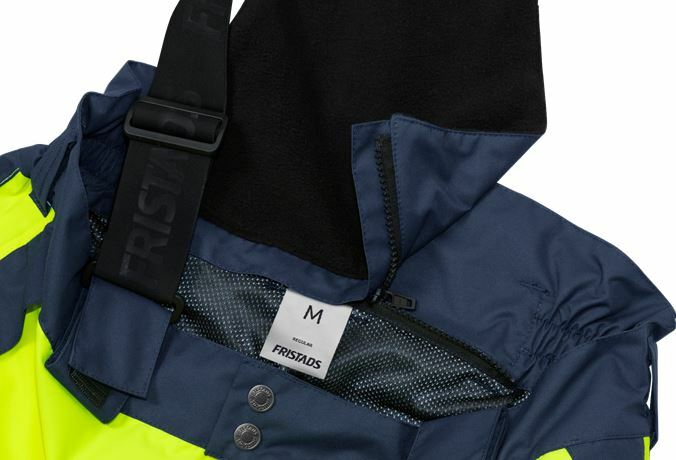 Weight: Outer fabric 150 g/m², lining 65 g/m². Airtech® breathable, wind and waterproof / Detachable braces with fleece yoke at back / 2 front pockets with concealed zip / 2 bellowed back pocket with flap and velcro fastening / CORDURA® reinforced folding rule pocket with tool pocket, pen pocket, button and loop for sheath knife / Leg pocket with flap and velcro fastening, mobile phone pocket with flap and velcro fastening, D-ring / CORDURA® reinforced knee pockets with inside opening / Height adjustment for knee pads in knee pocket / Concealed zip up to knees / Snow lock / Adjustable leg ends / Waterpillar 10.000 mm / Approved according to EN 14404 together with kneepads 124292, EN ISO 20471 class 2 and EN 343 class 3/3 / Leasing-laundry tested according to ISO 15797 / OEKO-TEX® certified.